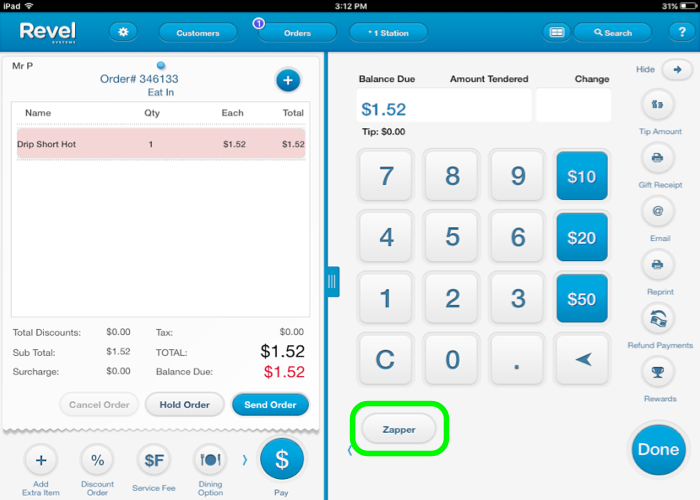 Zapper is a QR code-based mobile payments option integrated with Revel POS. Our integration allows your customers to pay for orders using the Zapper app by scanning a QR code displayed either digitally on screen or printed on a customer receipt. Please contact Revel Support to have your Management Console ([yoursubdomain].revelup.com) enabled for Zapper payments. Your Zapper Merchant ID (supplied by Zapper). Your Zapper Site ID (supplied by Zapper for each establishment using Zapper). A suggested tip percentage to prompt customers who pay with Zapper. (Optional) A logo image file to display under the Zapper QR code you'll present to your customers (Support can help you upload it). Once we're able to input your Zapper IDs, currency type and suggested tip percentage, you're ready to get started! After adding items to an order, tap the Print Guest Check button at the bottom left of the screen. Once a receipt with a Zapper QR code prints, ask the customer to scan the code with the Zapper app on their mobile device. Hold the order on the POS app. Total payment made via Zapper for the balance due will reflect on the POS app after a short delay. In Revel’s 2.22 POS app release, the ability to generate a QR code on a Customer Display System (CDS) is now available. This allows Quick Service establishments, for example, to ensure payment is accepted via Zapper before completing a transaction. After adding items to an order, tap the Pay button at the bottom of the screen. A QR code will display on the CDS for the customer to scan. Once scanned and registered in the customer’s app, the QR code will disappear and payment will be applied to the order.